Hole 1 Par 4 – Blue 345m; White 316; Yellow 282 The perfect starting hole – a straight tee shot to one of the largest greens on the course, protected from the left and right with green side bunkers. With out of bounds down the left hand side the slope is left to right. The ideal line is left fairway. Hole 2 Par 4 – Blue 329m; White 307; Yellow 271 The real challenges begins. The dogleg left, with out of bounds along the left side, presents a fairway bunker directly in line of sight off the tee. There are a range of options, from flying the corner, laying up to the bunker or shaping a right to left following the fairway line. The second shot is into a long, narrow and sloping green protected on the right by two imposing bunkers and a severe slope on the left. Hole 3 Par 3 – Blue 137m; White 121; Yellow 99 This is all about carry, There is danger to both the right and left hand sides of the green – bunkers right and a sloping grass run-off to the left. When taking into account the wind, there may be a three club variation. Hole 4 Par 4 – Blue 375m; White 359; Yellow 328 One of the most challenging holes on the golf course. Into the prevailing northerly wind the golfer is challenged by the narrow fairway, strategic right-hand fairway bunkers and a grassy mound to the left. The shape and contours of the green and pin position bring different challenges, Bunkers protect both the left and right, while four distinct quadrants on the green make a three putt a real option. The hole is designed for the shorter hitters to play it as a par 5, laying up to the bunker, the second short of the greenside bunkers, with a pitch at the hole. The ideal shot is down the left fairway, leaving a mid-iron into the green. Hole 5 Par 5 – Blue 490m; White 458; Yellow 407 Being accurate off the tee is critical. With two solid shots a good third can promise a birdie opportunity. Risk is being short left as the ball will not stay on the green. Hole 6 Par 4 – Blue 360m; White 330; Yellow 323 Right to left dogleg again the tee shot is critical to set up the approach to the green. Right-hand side pin placement ensures a challenging putt that will gain speed when running away from the river. Hole 7 Par 4 – Blue 330m; White 325; Yellow 314 The ultimate risk and reward hole. Lose your tee shot right or left and the chances of a par go with it. If straight a birdie becomes a real opportunity the green is protected front right and side left by bunkers, raised tier at the back of the green. Hole 8 Par 3 – Blue 160m; White 145; Yellow 128 A Par Three to remember – the pin placement adds to the element of difficulty. This hole is played into the prevailing wind which brings the large right-hand side bunker into play. Don’t be long as the slope will carry your ball into surrounding trees. Hole 9 Par 4 – Blue 380m; White 352; Yellow 328 The tee shot is the critical play here as long and to the left will enable a second shot to the green. Miss right and the trees bring the bogey into play. Hit the green surface and you will be safe, miss the smallish target and you will pay the price. Don’t be long. Hole 10 Par 5 – Blue 496m; White 474; Yellow 411 Open the second nine with a solid Par Five – long and straight with out of bounds down the right. Fairway bunkers come into play on the left meaning you must be accurate for your approach. Hole 11 Par 3 – Blue 138m; White 130; Yellow 116 A lovely Par Three with a slight twist in that judging the distance to the pin from the green front can fool the golfer. If short, danger left and right with four bunkers coming in to play. 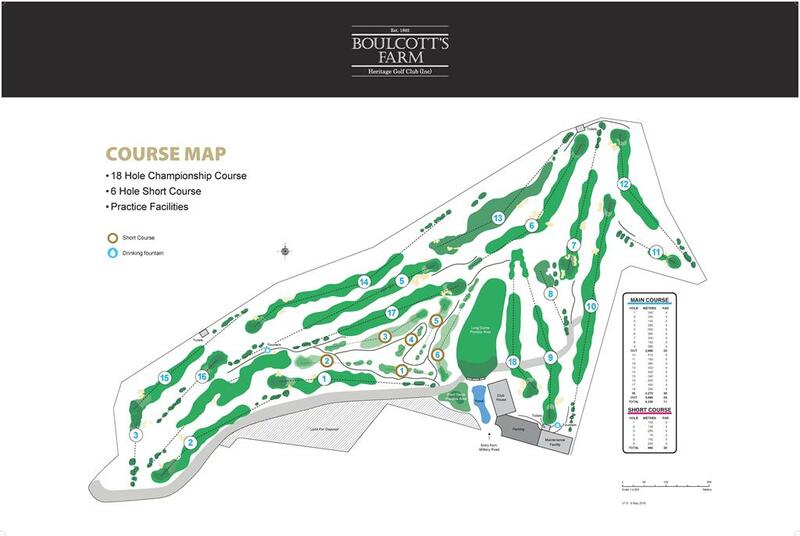 Hole 12 Par 4 – Blue 333m; White 318; Yellow 309 A signature hole which challenges the golfer throughout. The right-hand dogleg can be taken out of play by the long-hitter, but another where a miss could prove costly. The sloping green means the approach must be accurate to lessen the putting distance. Hole 13 Par 4 – Blue 388m; White 353; Yellow 346 With a slight left to right dogleg into a large flat green, the golfer must ensure the tee shot paves the way for a direct approach. Only danger is from right with a large shallow bunker. Does pay not to go long. Hole 14 Par 5 – Blue 498m; White 464; Yellow 439 The sign on the tees says it all the ultimate driving hole. A double dog-leg which means the approach to the green must be played from right of centre. A stunning approach undulated and surrounded by bunkers. Hole 15 Par 4 – Blue 330m; White 308; Yellow 280 A wide fairway which tempts the golfer to open the shoulders. A slight rise to the tandem green which is shared with the Par 3 third hole. Hole 16 Par 3 – Blue 186m; White 158; Yellow 123 This is all carry to the green which throws up an additional challenge in being long and narrow. The tee shot is critical. Hole 17 Par 4 – Blue 339m; White 317; Yellow 296 Long and straight this hole will pay a dividend if the fairway is found off the tee. The approach to the green provides safety centre left, right you risk running off the green surface then requiring a difficult chip. Out of bounds down the right-hand side of the fairway. Hole 18 Par 4 – Blue 330m; White 300; Yellow 275m A shortish Par Four which is rimmed right and through the right-hand side of the left-hand dogleg by out of bounds. Bunkers protect the left-hand side and the green approach both right and left. Standing on the tee you have the option of hitting anything from driver to five iron. Shot and club selection can make or break this finishing hole.